This is the second edition of Discworld, for 4th edition GURPS. It's obvious really. Everyone* knows it. The Disc rests on the back of four giant elephants, who in turn stand on the back of Great A'Tuin, the only turtle to form the basis of an entire branch of astrophysics. 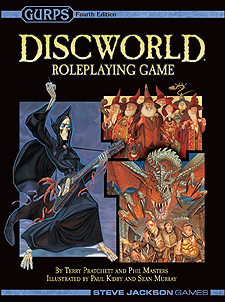 <>,p> For many years, events on the Discworld have been chronicled in the works of Terry Pratchett. Fans have enjoyed the adventures of Rincewind the incompetent wizard, Granny Weatherwax (known to trolls as "She Who Must Be Avoided"), Commander Sam Vimes, Susan Sto Helit (granddaughter of Death), Moist von Lipwig, and a cast of other strange and unique characters. THRILL to the distinctive sights, sounds, and smells (especially smells) of Ankh-Morpork, most dubious city in the multiverse! SAIL the Circle Sea in pursuit of glory, pirate gold, or a suntan! INTERVENE in the cultural interactions of trolls and dwarves (watch out for flying axes)! WONDER why they bought a second meat pie from Mr Dibbler! RUN AWAY from an angry Swamp Dragon (two feet of mindless fury and high-explosive digestion)! LEARN why the second-greatest lover on the Disc needs a stepladder. * Except the devout followers of the Great God Om, who firmly believe it's a sphere.